Colonel Rick Erickson is in his twenty-sixth year of combined active and reserve service as both an Infantry Officer and Judge Advocate in the United States Marine Corps. Colonel Erickson’s military career includes deployments to Southeast Asia, Africa and the Middle East. He has served with joint commands including allied coalitions and armed forces from all branches of the United States military, and he wears fifteen personal and unit commendations. In 1990, Colonel Erickson graduated from the University of Arizona with a Bachelor’s Degree in Political Science. He was commissioned Second Lieutenant in 1991 after graduating from Officer Candidate School in Quantico, Virginia. In 1992, he completed Officer Basic School and was selected as an Infantry Officer. He graduated from Infantry Officer Course and was assigned to 1st Marine Division, Camp Pendleton, California. He reported to 2d Battalion, 5th Marine Regiment, where he led a rifle platoon and weapons platoon with Fox Company 2/5. During his tour at Camp Pendleton, Colonel Erickson trained in small boat operations and, in 1994, he deployed with Battalion Landing Team 2/5, 11th Marine Expeditionary Unit/Special Operations Capable. His deployment with the 11th MEU/SOC included joint military operations in Singapore, Somalia and Rwanda. Upon returning from deployment, he served as Officer in Charge of the 5th Marines Regimental Guard, assumed command of the battalion’s 81mm mortar platoon and later became the Assistant Operations Officer for 2/5. Colonel Erickson left active duty in 1995 and attended law school at University of the Pacific, where he earned his Juris Doctorate and a Certificate in Government Relations in 1998. During law school, he clerked for the United States Attorney prosecuting the Unabomber case in Sacramento, California, and he was an Honors Extern for California Governor Pete Wilson. In 1998, Colonel Erickson entered private practice in Arizona and became a partner with the Phoenix- based law firm of Snell & Wilmer, LLP in 2009. NORAD-USNORTHCOM concerning matters of domestic operational law and in April 2003 he participated in Operation Noble Eagle. In 2006-07, Colonel Erickson deployed for Operation Iraqi Freedom as Staff Judge Advocate for Task Force Military Police and 3d Battalion, 14th Marines. After directing pre- deployment training in the Law of War and Rules of Engagement, he became the Operational Law Advisor for I Marine Expeditionary Force’s Detainee Operations Task Force and served as a primary Geneva Conventions analyst for Multi National Forces-West and Multi National Coalition-Iraq. He was responsible for inspecting, evaluating and reporting on all detainee areas used by coalition and Iraqi forces in Anbar Province. In 2008, Colonel Erickson was appointed to the Operational Law of War Branch at The Pentagon in Washington, D.C. There, he handled matters of international and operational law, prepared presentations at Naval Justice School for deploying Judge Advocates and handled daily action items from Congress, Headquarters Marine Corps and operating forces abroad in Afghanistan, Iraq and Horn of Africa. In 2010, Colonel Erickson served with 3d Marine Aircraft Wing, assuming responsibilities as Staff Judge Advocate to the Base Commander at MCAS Yuma, Arizona and providing advice on matters of Arizona and federal law affecting joint military exercises at the Goldwater and Chocolate Mountains Ranges and Yuma Proving Ground. 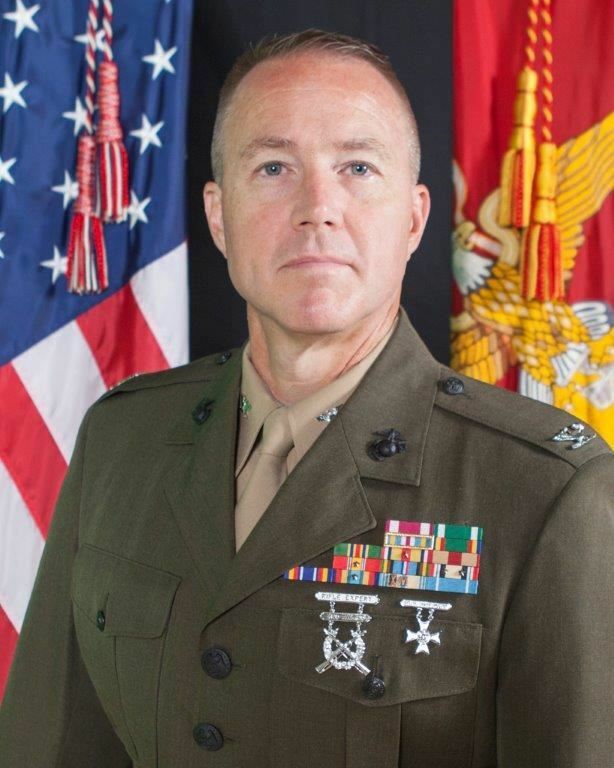 In 2013, Colonel Erickson was selected to be the Staff Judge Advocate to a new Major Subordinate Command, Force Headquarters Group, based with Marine Corps Forces Reserve in New Orleans, Louisiana. He was the chief legal advisor to the Commanding General, providing legal advice concerning government ethics, administrative discharges, investigations, military justice and operational law supporting the annual PANAMAX joint forces exercise with U.S. Southern Command. In 2017, Colonel Erickson returned to his infantry roots and joined the G-3 Operations Staff at I Marine Expeditionary Force at Camp Pendleton, California. At I-MEF, Colonel Erickson assists with planning operational exercises for deploying units and joint forces. Colonel Erickson is an Honor Graduate of Joint Forces Staff College, Joint & Combined Warfighting School, where he received the LTG Paul Cerjan Distinguished Writing Award for Cyberwarfare – Making the Case for Deadly Force. In 2016, Colonel Erickson published Synchronizing National Security Law and Strategic Interests of the United States as part of Thompson Reuters® Inside the Minds. Colonel Erickson also has diplomas from U.S. Air War College, U.S. Naval War College, Marine Corps Command and Staff College and National Defense University, including advanced courses in National Security Decision Making, Strategy and Policy, Government Ethics, Naval Operations, Joint Operational Warfare, Domestic Operational Law and Rules of Engagement. Since 1996, Colonel Erickson has served on Congressional Military Academy Nomination Committees for Senator Jon Kyl and Congressman John Shadegg and now serves on Nomination Committees for Senator Jeff Flake and Congressman Trent Franks. In 2011, Colonel Erickson was appointed by Governor Brewer to the Arizona Court of Military Appeals, which presides over National Guard cases subject to review by the Arizona Supreme Court. Colonel Erickson has been married twenty-one years, has a daughter in college and a son in high school.